Work on the ship began again in the spring of 1934. Number 534 was to be the final word in British shipbuilding. The vessel was to cost £5 million to construct and was to be the first liner over 1,000 feet long. Gross tonnage was 81,000. A total of 10 million rivets held the ship together, and 70,000 gallons of paint were required to paint the hull. Passenger capacity in the three­funnelled liner was 776 in cabin or first class, 784 in tourist or second class and 579 in third class. The ship carried a crew of 1101. The new liner incorporated magnificent Art Deco interiors featuring 50 types of wood. Not surprisingly, the showpiece accommodation was cabin class, and it included a 143-foot long restaurant, children’s playrooms, lounges, a library, galleries, smoking rooms, drawing rooms and shopping outlets such as a W. H. Smith newsagent and Austin Reed clothiers. There were also ballrooms, a gym, squash courts, a swimming pool and the first ever shipboard synagogue. King George V and his wife Queen Mary, after whom the ship was named, launched the Queen Mary on an overcast 26 September 1934. Following its fitting out in the River Clyde and sea trials, the Queen Mary had its maiden voyage from Southampton to New York two years later, averaging 29.13 knots. After a few adjustments and modifications, the Mary captured the Blue Riband from the French liner Normandie in August 1938 for the fastest north Atlantic crossing with an average speed of well over 31 knots. But the Queen Mary did not have long to bask in its role as the fastest liner in passenger service. 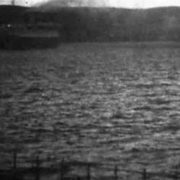 War clouds were on the horizon, and the Mary was pressed into service as a troop transport ship in 1940. By the end of the war, the ship had carried 810,730 passengers and steamed 661,771 miles around the world. This service was significant. British prime minister Winston Churchill claimed the contribution to the war effort of the Queen Mary and its sister ship the Queen Elizabeth helped to shorten the Second World War by at least a year. 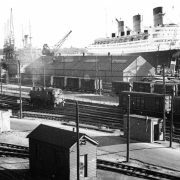 Upon its release from war service on 29 September 1946, the Queen Mary underwent a 10-month refit in Southampton before re-entering commercial service. In 1952 the ship surrendered the Blue Riband to the S.S. United States, which crossed the Atlantic with a remarkable average speed of 35.59 knots. In 1958, as many people were crossing the north Atlantic by aircraft as on ocean liners. On one particular voyage in November 1961, the ship carried only 470 passengers out of a capacity of over 2,000. Crew remained at over 1,000. The end was near for the Mary. In a desperate attempt to generate revenue, the Queen Mary went on cruising service in 1963. But the ship was an ocean greyhound unsuited for cruising, and it soon became obvious the Mary had outlived its usefulness. By 1967 the Mary was losing up to £8,000 a day. Something had to be done. In August 1967 it was announced that the city of Long Beach, California had bought the ship from Cunard for $3,450,000. The Mary would be turned into a museum, conference centre and hotel. And so on 31 October 1967, the liner left Southampton for the final time, arriving in California on 9 December 1967 to start a new life. In the end, the Queen Mary had steamed just over 3,790,000 miles and carried 2,114,000 passengers. Bettys, which claims to operate the most famous cafés in the world, was founded in 1919 in Harrogate by Frederick Belmont, a young Swiss confectioner. Business was brisk, and the 1920s and 1930s saw the addition of three other cafés in Yorkshire. In 1962 Bettys bought out Taylors of Harrogate, the coffee and tea business. There are currently four Bettys Café Tea Rooms, located in Harrogate, York, Northallerton and Ilkley, as well as a Little Bettys tea room in York. Bettys is still owned and operated by descendants of Frederick Belmont’s family. Afternoon tea is a tradition in England, and Bettys serves one of the best when enjoyed with its famous Yorkshire Fat Rascal. This speciality, served warm, is a fruity scone of citrus peels, almonds and cherries. The company is also well known throughout Britain as the blender of Yorkshire Tea, with over 8 million cups brewed everyday. The Belmont Room still retains many of its original 1930s features. 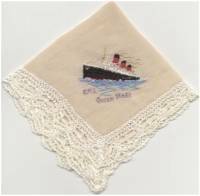 Its inspiration took root during Frederick Belmont’s journey with his wife Claire on the maiden voyage of the Queen Mary. 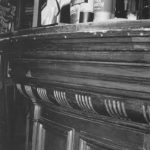 The ship represented the latest in innovation, speed, luxury and sophistication, and these were the distinctive qualities of the spirit of the age that Belmont wanted for his new café. On the six-day voyage to New York sailing on 27 May 1936, Belmont was so impressed with the vessel’s Art Deco interiors and fittings that he began to make arrangements to create a new café in York based on the Cunard White Star flagship. Plans quickly took shape when Belmont returned to England. Interior decorators for the Mary itself were commissioned to design the new Tea Room, and a team of London’s best shop fitters came to York to construct panelling, pillars and mirrors similar to that adorning the ship. The new Bettys opened its doors for business in York on 1 June 1937, exactly one year to the day that Belmont disembarked the Queen Mary in New York City. The Belmont Room is available for private parties, wedding receptions, functions, recitals, meetings and other special events. When I visited Bettys several years ago, staff were more than willing to show me around the Belmont Room and allowed me to take photographs. For further details on the Belmont Room, Bettys in York can be reached on (01904) 659142. 1 The following brief overview of the Queen Mary’s history comes mainly from David Hutchings’ RMS Queen Mary: 50 Years of Splendour. 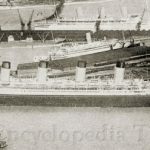 2 At the same time, the government also insisted that Cunard and its great rival White Star merge into one shipping concern. White Star, British-owned once again after 1927, as it had been prior to its purchase by American financier J. P. Morgan in 1902, was purchased by the Royal Mail Steam Packet Company, then under the chairmanship of Lord Kylsant. 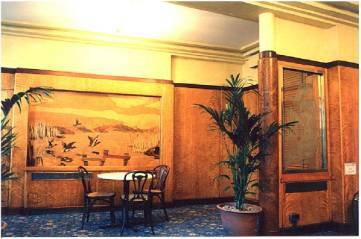 4 There are other examples of the Spindlers’ marquetry at the Bettys locations in Harrogate and Ilkley. 5 An example of a Spindler flying geese marquetry in a Queen Mary cabin class bedroom can be seen on page 13 of David Hutchings’ book RMS Queen Mary: 50 Years of Splendour. Frank O. Braynard and William H. Miller, Jr. Picture History of the Cunard Line 18401990, (Dover Publications: New York 1991). David Hutchings, RMS Queen Mary: 50 Years of Splendour, (Kingfisher Publications: Southampton, Third Impression, 1990). Various promotional materials from Bettys Café Tea Rooms, (undated). Ephemera and photography from Gavin Murphy Collection.